Suzuki TU250X has the looks of a classic British motorcycle. It looks like a Royal Enfield! That's the claim to fame made for a 2009 Suzuki TU250X, for sale on CraigsList in Apopka, Fla.
To be fair, the seller also claims that it looks like a Ural — which it doesn't. But, regardless, his reference to Royal Enfield is obviously meant to flatter. The Suzuki TU250X looks just fine. Fans of Royal Enfields have pointed out before that it would be well worth consideration, if you must buy Japanese. Despite its looks, the little 250cc single is more likely to be a "singer" than a Royal Enfield-style "thumper." 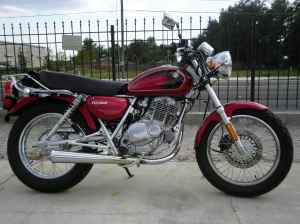 It's also likely to be reliable, easy on gas and maybe even faster than a 500cc Royal Enfield. I suppose reliability, economy and practical speed are the price you pay when you buy a Japanese motorcycle. Having been there (on a Honda 250) I wouldn't have it. Look at it this way: You are never going to see an ad for a Royal Enfield that promises "It looks just like a Suzuki TU250X."